You can now filter notes by tag in the search box, including multiple tags. For example, if you wanted to search for notes tagged ‘travel’ and ‘poetry’, you would enter ‘tag:travel tag:poetry’ in the search bar. We’ve made some UI improvements to the app, including better support for running the app at smaller screen sizes and a new placeholder view that shows when there are no notes to display in the app. Many performance and reliability updates. A security fix related to cross-site scripting in the markdown preview. The app should prompt to download the new version the next time you launch it. New to Simplenote? You can download the app here. Some of you may be wondering about the status of the beta for macOS that we released earlier this year. We’ve decided to focus our development on the native app so that Simplenote can have the best experience on macOS. Stay tuned for more updates on that soon! If you still are interested in running the electron-based app on macOS, you can download it here. Happy noting from the Simplenote team! New updates are now available for Simplenote iOS and macOS. Updated tag menu which makes it easier to access the Trash and Settings. Font changed to San Francisco for better readability and language support. You can also now search your notes via Spotlight. This setting can be turned off in the iOS spotlight settings if you prefer. The macOS update is mainly bug fixes. If you’re interested in more details, you can view them over at GitHub. We’d like to thank all of our Open Source contributors that helped with these releases. We hope you enjoy the updates and happy noting from the Simplenote team! In this spirit, we are announcing today that all of the official Simplenote client apps are now Open Source Software under the GPLv2 license. In addition to the previously open sourced Electron app, you’ll now find the source code for the iOS, Android, and macOS applications on our GitHub page. We love using Simplenote at Automattic and hope that we can build a great community of contributors from around the world to help make the apps even better. Today we launched version 1.5 of Simplenote for Android, which includes a design refresh to match up with our new Windows and Linux apps as well as the ability to add formatting to your notes using markdown. A fix for notes sometimes not syncing when the connection went offline. Links now open in an external browser instead of an internal window. The apps can be downloaded here. Want to help make Simplenote better? It is open source and accepting pull requests over at GitHub. Today we welcome two new apps into the Simplenote family. 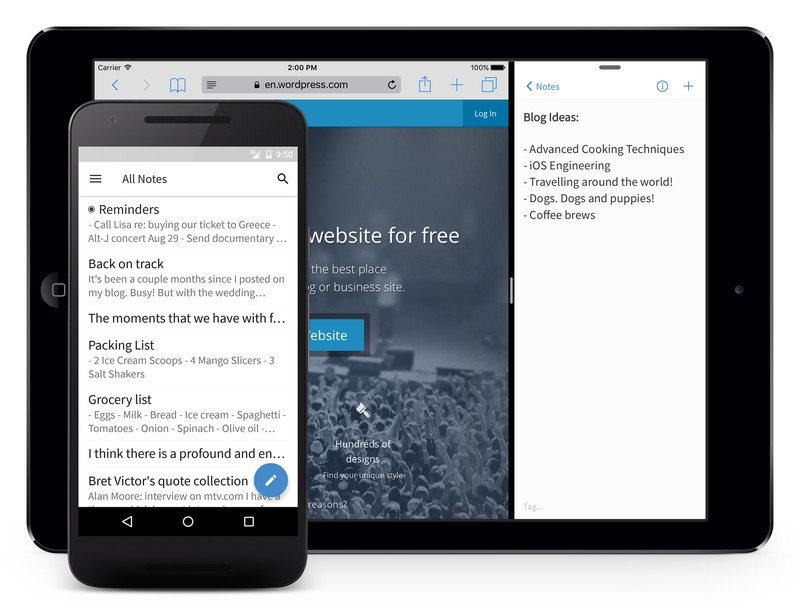 Simplenote first started on iOS and has expanded to include Android, Mac OS X, and now Windows and Linux. Visit our downloads page and try them out. Just like all Simplenote apps, they are completely free. We’ve included all the features you’ve come to rely on. If we missed something, let us know. Simplenote for Windows and Linux supports Markdown. To get started with text formatting, check out the basics. First, enable it globally by going to the toolbar menu and selecting Preferences → Writing → Enable Markdown. Next, enable it on your note by selecting the Info panel icon and toggle the Markdown setting. Now, you’re ready to edit and preview Markdown! For the first time in Simplenote’s history, we’re open sourcing the Windows and Linux apps on GitHub! You can peek at the code, or if you’re a developer, you can contribute to the project. The app is built with React and runs on Electron. If you run into any issues with Simplenote for Windows or Linux, please contact us. Download Simplenote for Windows or Linux. Hello, Simplenoters! New updates are now available for iOS, Android and OS X.
We’ve fine-tuned the app for iOS 9: Simplenote now allows multitasking on supported iPads using both Slide Over and Split View modes. Multitasking is a very handy way to get information copied to and from Simplenote quickly! We also greatly improved the performance of the app when working with large notes and added support for additional languages. The Android update includes many tweaks to the Material Design-based theme of the app. You’ll now see more native components throughout the app which gives it an even cleaner look. The light theme is also looking better than ever with a new white toolbar. We also tweaked the tablet layout by moving the create post button to the list while viewing in landscape, so it doesn’t get in the way of the note editor. In addition to many bug fixes, the OS X app has received a huge performance upgrade in the latest update. You can now work on very large notes without issue. We hope you enjoy the latest Simplenote updates. We’re continuing to iterate on the app and have some great ideas stewing for the future. Be sure to follow us @simplenoteapp for the latest!